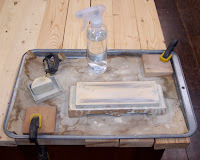 You can purchase waterstone holders, you can make fancy wooden ones which secure your stones with wedges, and you can suspend your stones over a tub of water on a wooden or plastic bridge. Or, you can use a set up like this, which consists of a shallow baking pan (heaven knows it wasn't seeing any use in ou r kitchen) and a router mat. Fancy? No. Attractive? No way. Functional? Absolutely. Clamp the baking pan to your bench and start sharpening. The stone will not move at all. Sharpening is messy business, so I didn't want to build a pretty holder only to have it gunked up with the slurry created with water and stone particles. The odd thing is, with all the water spritzing I've done over the years, I've never had to pour any water out of the baking pan. Not sure where it goes. Could be I have broccoli growing under the router mat, but I'm not about to check.